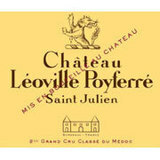 Château Leoville-Poyferre produces elegant, refined, complex and well-balanced wines known for their intense colour and velvety texture. They are excellent keeping wines. Barrel Sample. This is a generous, rounded, juicy wine, with already a fine balance between tannins and fruit. Black currant flavors are contrasted by a dry, solid core that shows the wine's impressive potential.